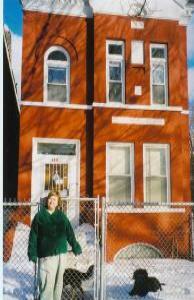 Women's Residence for women travelers to or through Chicago. you how to get around on easy public transit just 2 blocks away. friends in first floor gallery. historic neighborhood just blocks from several major streets. There is a large yard with many interesting things happening in it. level there is an art studio. Clases & workshops are available. a concert or to the theatre and stay here. One woman one night is $45. Two women one night is $55. booked. No refunds but can have credit toward another visit. One woman staying at monthly rate is $550.mo.